Kathy and her eleven year old son have just returned from Ecuador, where they spent four days exploring some of the walks on our lodge to lodge Ecuador trekking trip. Ecuador is a land of dramatic landscapes and extreme contrasts and we think it is often overlooked by walkers – who prefer to head to the more well-known Inca Trail in Peru – missing out on the great walks Ecuador offers. We set off through the tail end of Quito’s rush hour traffic and within half an hour were in lush green countryside. Over the next four days we walked through beautiful valleys rich with wildlife up into the scenic paramos of the national park of Cotopaxi. The first two days were gentle walking alongside the river Pita, a small bubbling river, of fast fresh mountain water, with waterfall after waterfall. We saw bright red mountain tanagers eating fruit in the trees, a pair of torrent ducks, my favourites, leaping into rapids, hopping out onto boulders, dippers also performing underwater acrobatics, and dozens of mountain caracara and hummingbirds zipping from flower to flower. It was a fabulous warm, wildlife rich couple of days. Over the next two days we went higher, the vegetation changing to scrub and stunted trees, ground level flowers, and cushion shaped plants, staying low to avoid the wind and cold of the highland plains. Andean condors are relatively rare in Ecuador, but we saw one soaring overhead, a thick coated fox trotted past and we passed several herds of wild horses. My son collected animal bones as we walked. Up here there was a fabulous sense of space and no other trekkers around. We spent a day horse riding at the end of our trek, but others can choose to climb Cotopaxi or Rumiñahui, or head back to Quito on onwards to explore other corners of Ecuador. Who would our lodge to lodge Ecuador trekking tour suit? This hiking tour offers some of the best trekking in Ecuador in maximum comfort. The trek is suitable for all abilities as the daily walks can be tailored to how you feel each day with options for just a couple of hours of walking to longer tougher days. A vehicle transports all luggage (so you only carry a day pack) and is on hand too for walkers that would like to cut the day short. 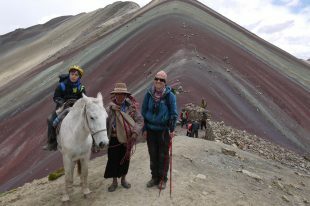 We offer variations on this lodge to lodge tour to suit: a 4-day walking tour, a 5-day walking trip with a Rumiñahui (4,600m) ascent or horse riding day, and a 7-day version of this trek with ascents of both Rumiñahui and Cotopaxi. When is the best time to go trekking in Ecuador? The drier months are April/May to early/mid October, but you can walk here at any time of year.